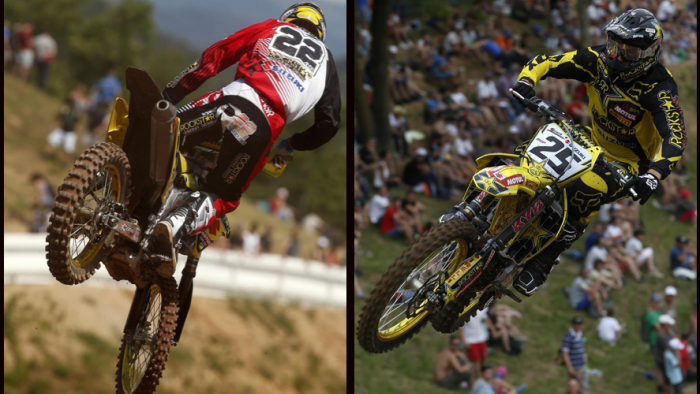 Kevin Strijbos was a pushy and consistent force at the front of the premier class of the FIM Motocross World Championship as the Rockstar Energy Suzuki World MXGP rider steered his RM-Z450 to a fourth podium of the 2014 series today. The Belgian celebrated third position at the Grand Prix of Italy for round 10 and the 19th and 20th motos of MXGP category this season as team-mate Clement Desalle survived a hefty crash in the first race to finish fourth overall. Changeable weather meant that the hills of Maggiora were slick in places, and while the Italian soil provided line choice it was still tight, winding and uncompromising when it came to overtaking. Some 35,000 spectators meant a noisy and appreciative reception for the riders and stars of the MXGP and MX2 shows. Strijbos worked hard for his silverware and negotiated some arm-pump as well as some tough scrapes with the likes of Steven Frossard to secure the fourth and third positions in the two 20-minute and two-lap motos necessary for the RM-Z450 to again be part of the rostrum ceremony. The Belgian’s starts were not emphatic but the way he was able to attack the Maggiora inclines was impressive and constant. Desalle was comfortably chasing first moto leader and eventual winner Antonio Cairoli in the first moto until a small mistake between line choices on the approach to a jump led to a scary dismount. The Belgian was lucky to escape with only a painful left wrist and it was testament to his determination that he was able to pick up the ‘#25’ machine and ride to the chequered flag throughout the second half of the race in seventh position. Desalle was not able get away with the leaders at the beginning of the second moto but chased the shadow of his team-mate in fourth spot after dispensing with David Philippaerts. After two motos at the Grand Prix of Italy the FIM MXGP world standings reveal that Desalle has lost some ground to Cairoli and the red plate. The gap is now 38 points. Strijbos meanwhile retains fourth position and is almost 100 points clear of fifth place. Rockstar Energy Suzuki World MXGP only have a few days before attention turns to round 11 of 17. The impressive circuit of Teutschenthal will host the Grand Prix of Germany next weekend for the first time since 2012 and since entertaining the Motocross of Nations last September.